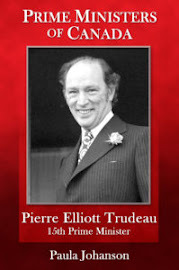 Today Canadian writer Barbie Thompson sent a quick review of my latest book, a biography of Pierre Elliott Trudeau. You can learn a little about Barbie and her writing on her Facebook page. I congratulate you on a wonderful book on Trudeau, pointing out, as you rightly did, the great things that man accomplished which many Canadians oft choose to ignore or on which they were never educated. Your series will go far in improving Canadian school childrens' knowledge of their great leaders and this great country. I wish I had had such a valuable resource when I was in school.